iShares, a coveted ETF platform, announced yesterday that the company will not renew its three year old partnership with Europe's Extreme 40 Sailing Series due to its pending acquisition by powerhouse asset management firm, Blackrock. "With a change in company ownership of iShares coming on 1 December, we are unable to commit to the sponsorship of this event in 2010, and we have had to use a break clause in our two year contract with OC Events. This break clause existed for a 10 day period only, following the final event of the year in Almeria." "The iShares Cup has been a phenomenal success for iShares and it is with much sadness that we have been obliged to make this decision. Client response from surveys has been phenomenal. They are just absolutely blown away by lots of different elements. However, we are confident that such an outstanding property will not be on the market for long, the value for money, the exceptional client experience and the return on investment from this property have really helped propel iShares forward, and I am sure that OC Events will be able to capitalise on our experience with a new partner shortly." OC Events, owner of the series, has already begun title sponsor negotiations to replace iShares, meanwhile additional shake-ups stemming from the planned acquisition are expected. For starters, iShares is conducting a full ad agency review, which incumbent agency Arc has declined to pitch for. 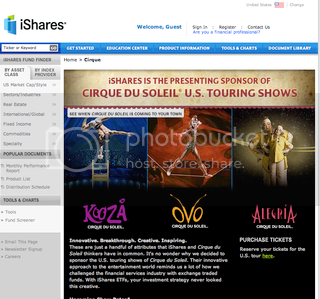 In the U.S., iShares most prominent activity is presenting sponsorship of Cirque du Soleil's U.S. Touring Shows. In 2007, iShares became the first presenting sponsor in the tour's history.